Part two of our three-part vanadium series examines the potential vanadium has to offer as an energy storage solution compared to other options. It also looks at comparative cost and environmental benefits of vanadium redox flow batteries. Part two in our vanadium series will examine the potential vanadium has to offer as an energy storage solution compared to other options, as well as looking at comparative cost and the environmental benefits of vanadium redox flow batteries (VRFBs). As mentioned in our previous vanadium article, VRFBs have been around in various sizes and forms for more than three decades, begging the question has there not been any other advancements in the energy storage sector? The simple answer is yes. Here, the Investing News Network looks at how other developments in the space compare to VRFBs. Other types of batteries include lithium-ion, sodium sulfur and advanced lead acid. Of these, lithium-ion is probably the most popular and widely known. Powering everything from your smartphone to your home’s security system lithium-ion has been the battery of choice, due to its compact nature and its affordability. However, lithium is volatile and if not stabilized and used correctly can result in a fire, like the ones Samsung (KRX:005930) Galaxy Note 7’s kept experiencing a few years ago. While lithium-ion has reigned supreme in the recent battery battle for small scale dominance, VRFBs are surging ahead as a major contender for the large scale energy storage market. Jaffe believes vanadium flow batteries will eventually prove to be cost-effective for long discharge and storage applications. However, according to Jon Hykawy, president and director of Stormcrow Capital, both VRFBs and lithium-ion batteries leave something to be desired. “We are talking about this as if VRFB and lithium are the only options, and actually, they are pretty lousy ones, based on the most important metric, which is cost,” said Hykway. According to Hykawy, power companies base their use of technology on a metric called the lifetime cost of electricity (LCoE). This is calculated by taking the capital cost of the device, adding in all the maintenance and operating costs of the device over its life, then dividing that by the total amount of electricity the device emits. “On that basis, VRFBs and lithium batteries don’t look that great,” said Hykawy. He went on to note that a recent analysis by financial advisory firm Lazard pegged the cost of VRFBs for use in the transmission system of the grid — the big bulk storage of electricity— ranges between US$314 to US$690 per MWh, depending on scale and builder. On the other hand, the cost of using lithium for the same thing varies between US$267 to US$561 per MWh, depending on exact chemistry and supplier. Hykway, proposes a third option for large scale storage. Not everyone is as skeptical about the potential VRFBs offer, although as analyst for Lux Research, Tim Grejtak pointed out, VRFBs are ideal in very specific situations. “Vanadium flow batteries make sense where three conditions are met: the energy storage systems needs to be big (100 MW), the system needs to provide power for relatively long durations (4 hours), and the system is used often (about once a day, every day),” said Grejtak. Whether its nuclear energy powered by uranium, wind or solar energy we are slowly moving towards a global green energy grid system. As we rethink the way we source energy it only makes sense that we also move towards new ways of storing that energy for short-term and long-term consumption. Unlike lithium, uranium or other energy metals, vanadium is 100 percent recyclable after it has reached the end of its performance life. In fact, after 20 years of use the vanadium in a VRFB can be recycled and used in the steel alloy production sector. The ability to re-use vanadium after it has reached its end life in the energy storage cycle makes it especially attractive in the green sector. 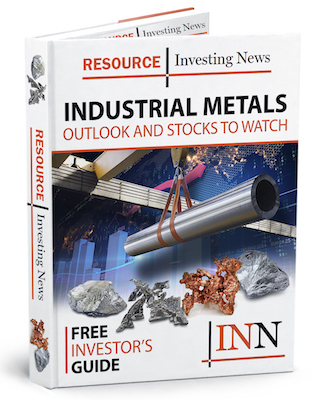 “If companies are thinking of creating the ‘gigafactory’ of vanadium flow batteries, they will either need to own a mine or implement a new pricing system where the fully recyclable vanadium in the battery is leased,” Simon Moores, managing director of Benchmark Mineral Intelligence, pointed out. “Because vanadium is fully recyclable from a battery there could be a contract where the vanadium is never actually purchased by the battery maker but is leased and then recycled at the end or sold on,” Moores further explained. The vanadium recovered in the recycling process can then be used in the construction industry as a steel alloy.